Winter, Dirty Woman Creek (mixed-media sculpture), among her compatriots at the Tri-Lakes Center for the Arts in Palmer Lake, Colorado. I’ve been interested in sculpture since I was a girl, the modern, the classical – just loved the idea of being able to walk around an object, or in an object in some cases, that was inhabiting space in three dimensions. Not that I don’t like painting and drawing, but there is something magical about sculpture, something almost human. Sculpture is about texture, it’s what you can touch, more than what you can see; it is skin and bones. It only misses that breath of life that God gave Adam. At my husband’s urging, I entered a contest to win entry into the Black White and Shades of Gray exhibit at the Tri-Lakes Center for the Arts, a small gallery near where I live. I sent in a photo of this work and it became part of their exhibit. It was the only object of its type present; all the other works were exquisite pieces of pottery or amazing drawings and paintings. I was proud that it was different in tone and style than anything else present. Art receptions can feel stuffy, but I did my best to have a good time. First off, I invited friends, then I introduced myself to all the other artists, who were mostly standing around quietly. I wanted to dispel the tension – to breathe life into the event also. Friendship among artists and poets is as important as the work itself, since that work is done mostly in isolation. We need each other, whether we like each others work or not. 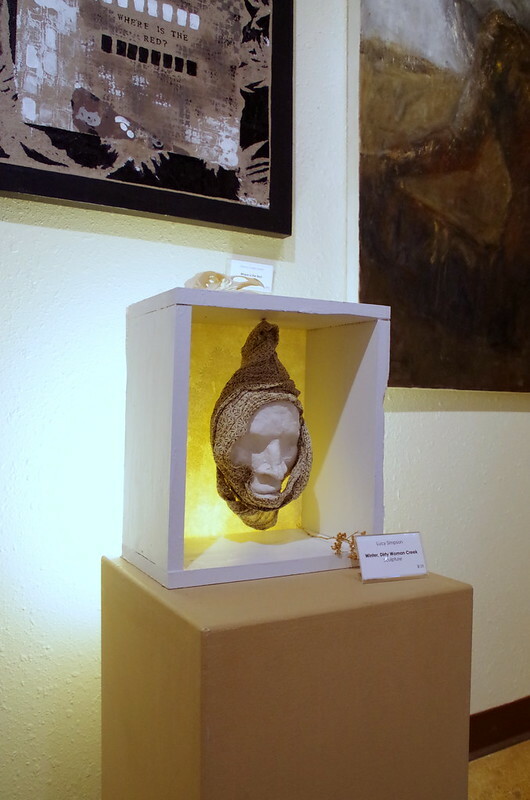 I was very grateful to be included and look forward to making more sculptures, incorporating bones, light sources, fabric and other materials that strike my fancy. I’m always chasing that thrill I got the first time I held a skull in a private room of the Museum of Natural History in Washington D.C. or the first time I saw a Giacometti or a Rodin. Energy pulses from the bone, from the piece. It can almost move, almost grow.